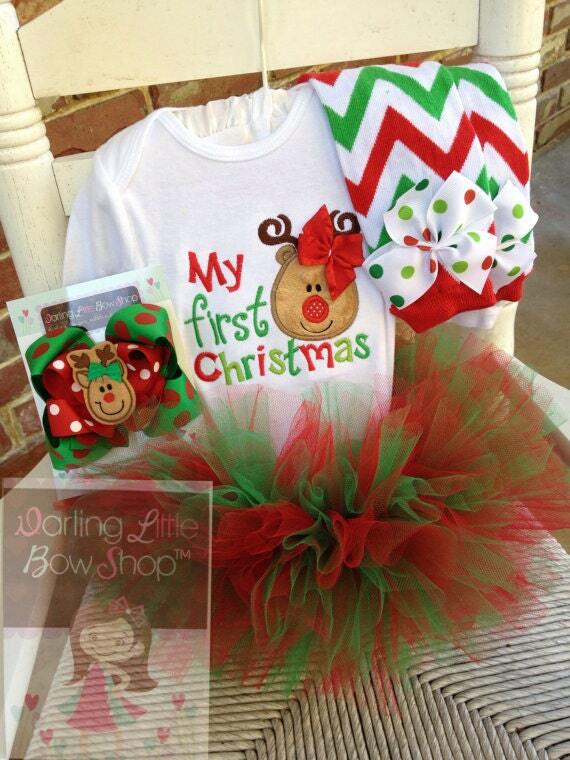 My First Christmas tutu outfit for baby girls with a sweet, soft reindeer and matching leg warmers and bow. 2. 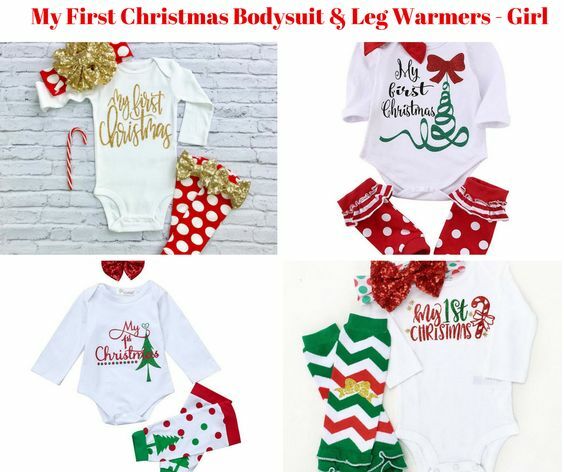 Leg warmers – available in newborn (8″) and regular size (12″). 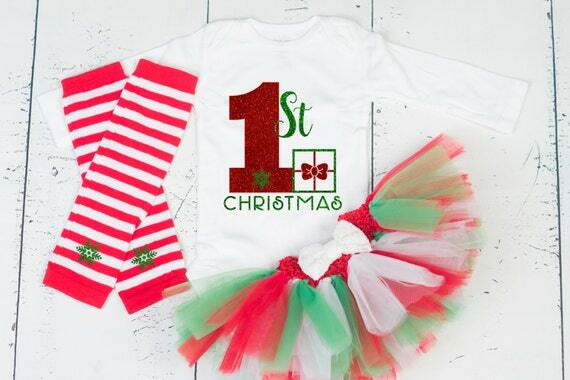 *ATTENTION: sizes 3 months and under will receive SMALL legwarmers (without ruffle). 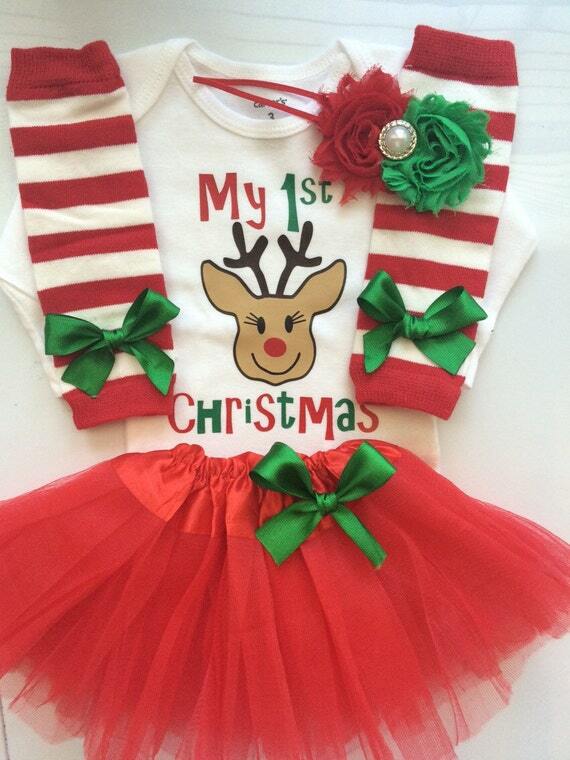 Sizes 6 months and over, will receive ONE-SIZED legwarmers (with ruffle). 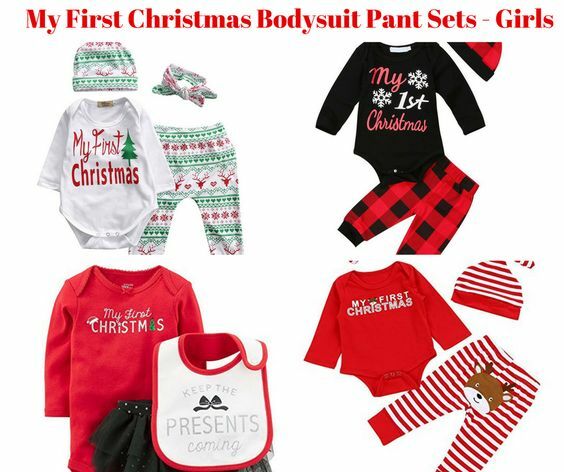 The onesie will be appliquéd with Princess Minnie which will include a sparkle stone on the appliqué and the text “My First Christmas”. Design is on a white bodysuit with flat gray and old blue glitter vinyl. 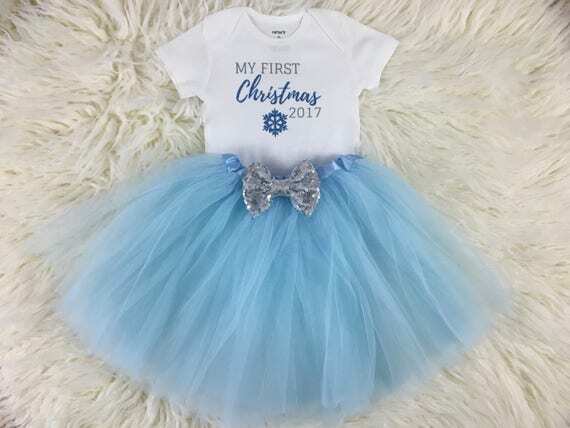 Comes with a light blue tutu with a 4″ silver sequin bow. The sequin bow is on a clip, so you can easily use it as a hair clip or switch it out with another bow for multiple looks! 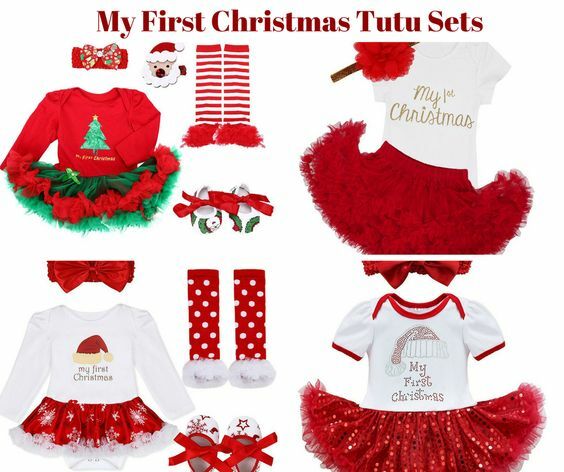 This wonderful tutu set is perfect for birthdays, portrait sessions, holidays, play dates, weddings, recitals, parades, special events, or just to play dress-up! 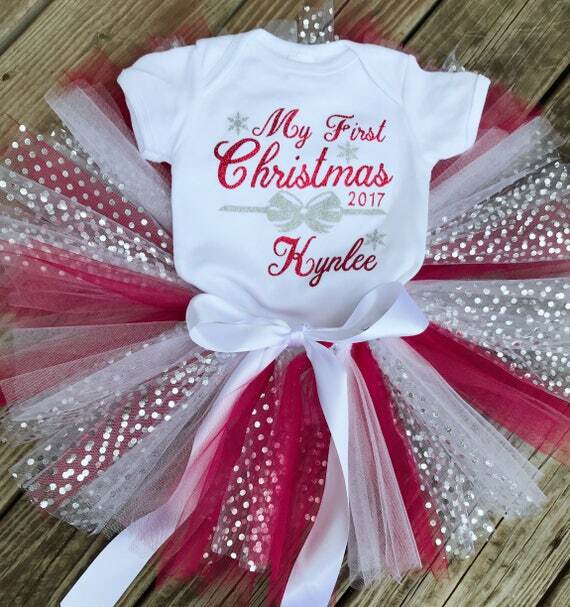 Tutus also make adorable shower gifts or decoration. 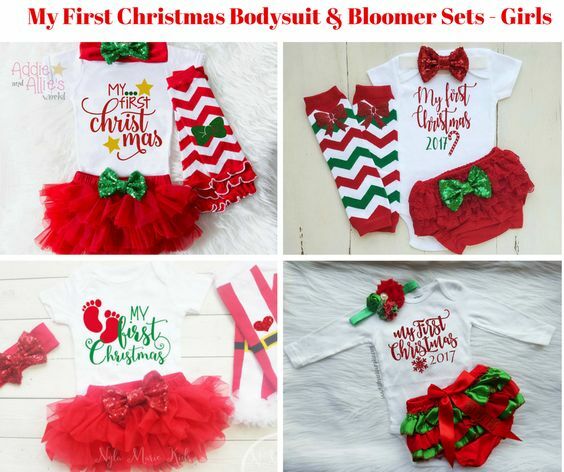 If you want to have an individual order, let me know about it. 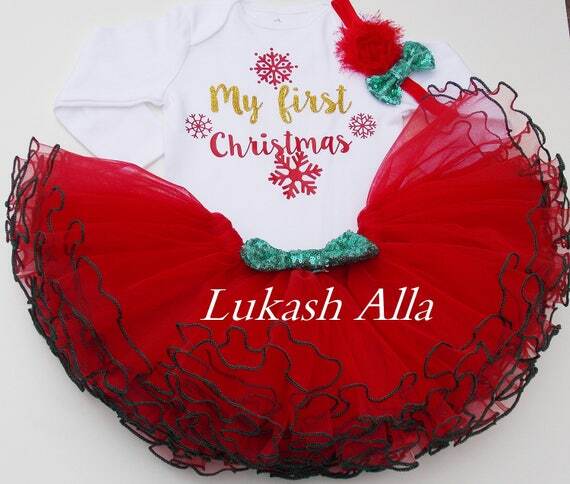 Personalized My First Christmas tutu set. 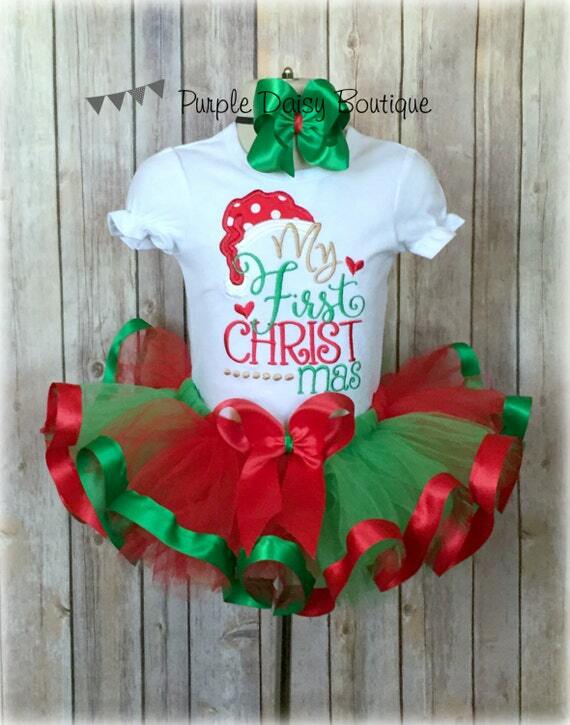 This is a great gift idea. 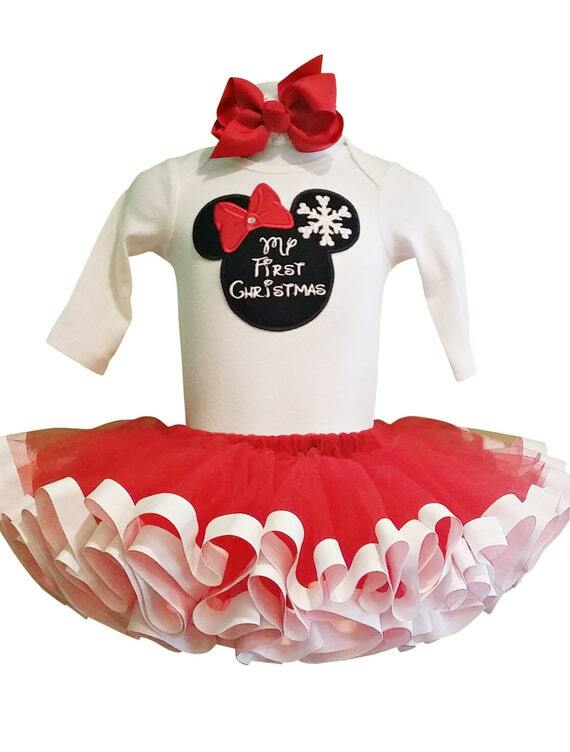 The tutu is red, white and silver polka dot tulle. 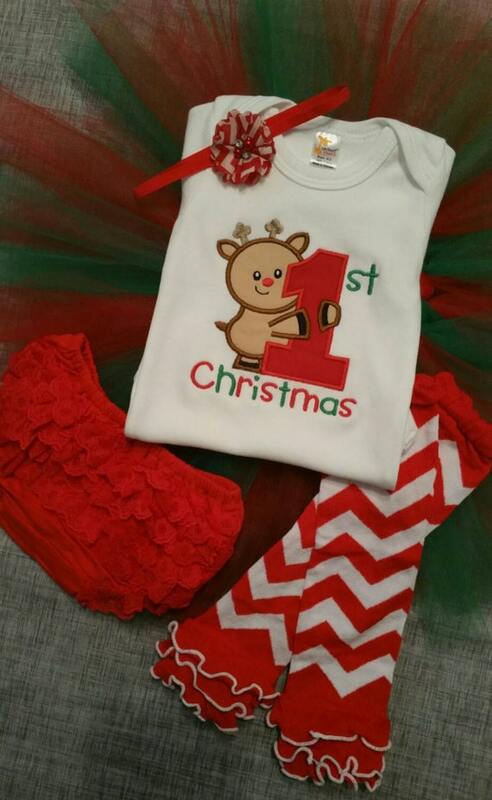 The shirt pictured is a white onesie with red glitter and silver glitter lettering. 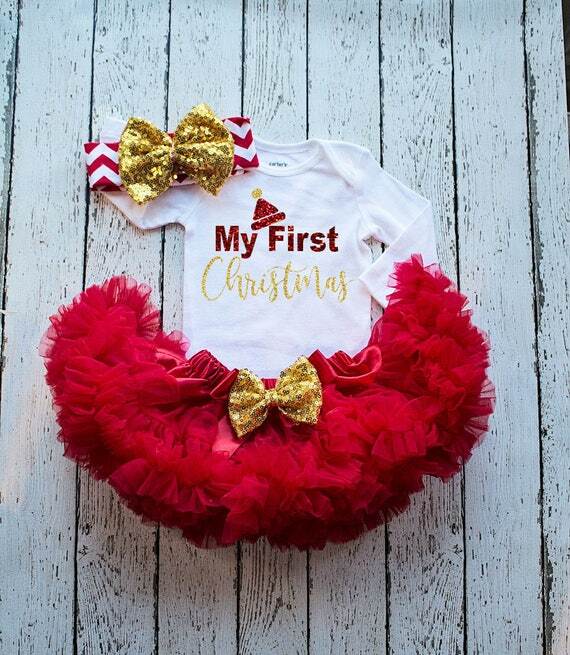 The shirt says my first Christmas and is personalized with child’s name & year. 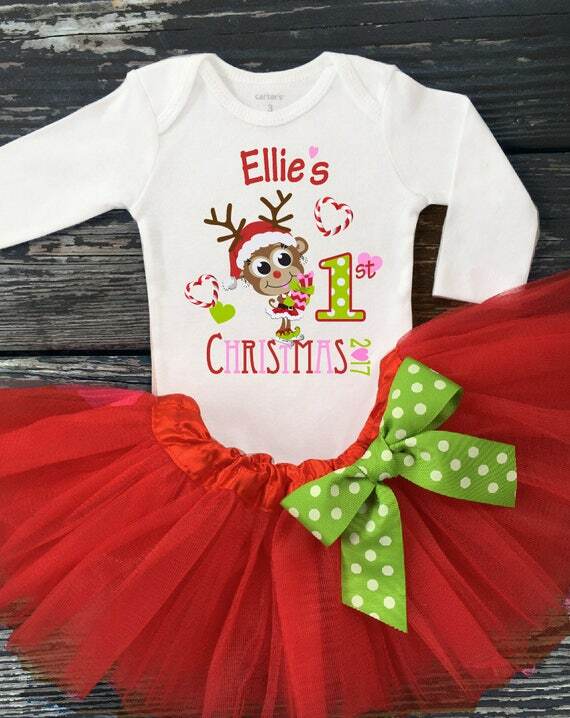 When ordering please include child’s name in notes to seller. 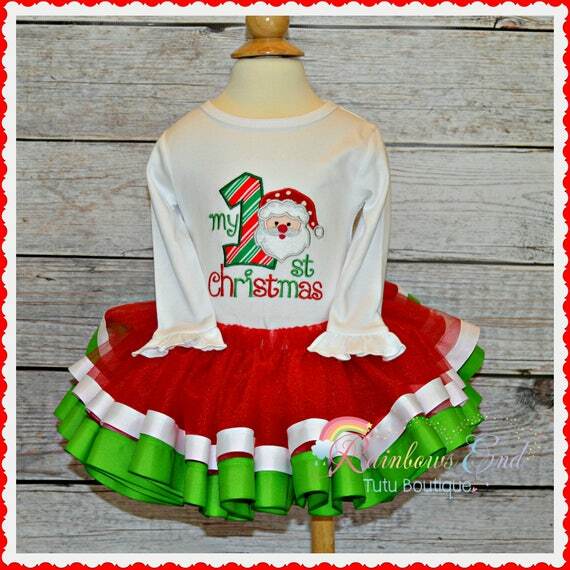 The shirt comes in two different styles regular t-shirts and onesies. I have included the tutu size chart that I use in the pictures. 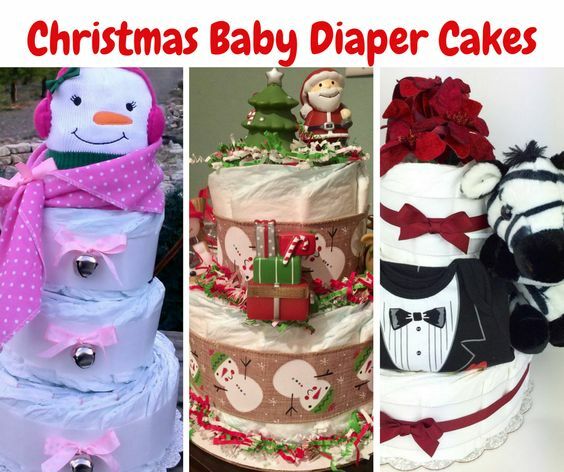 If you have any questions or would like a custom order please send me a message I love custom orders. 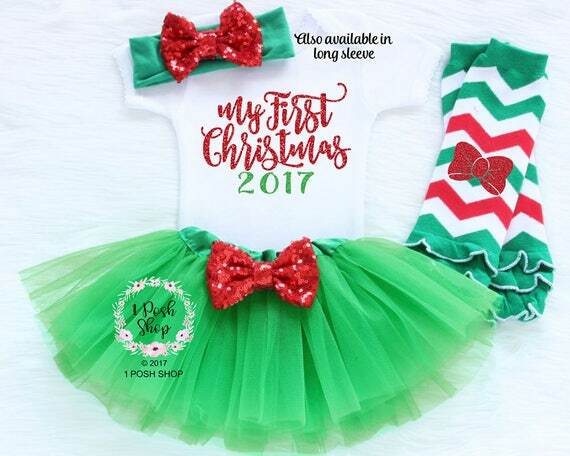 My First Christmas Tutu Outfit includes onesie, tutu, legwarmers, bloomers and a matching headband with removable flower clippie. Bloomers will be red and fluffy with a little lace. 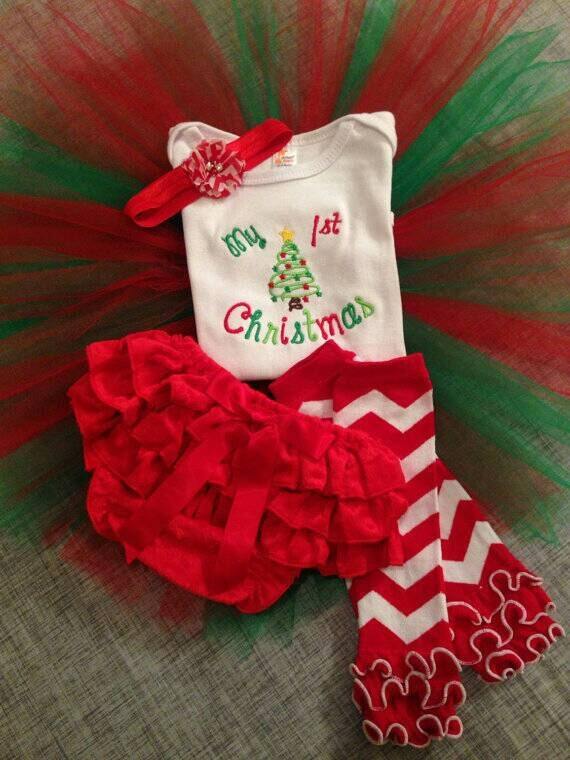 Legwarmers are red and white chevron patterned. 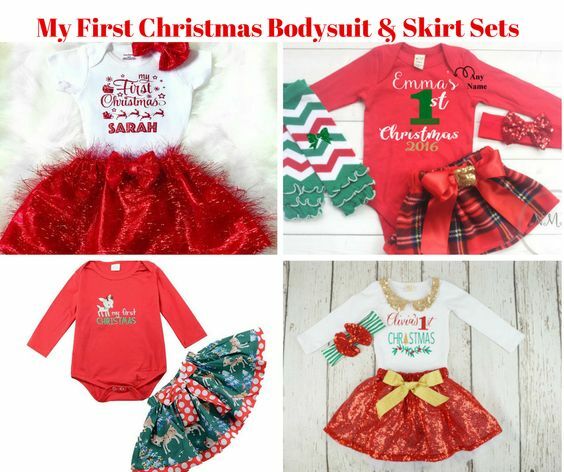 The are sized as a 0-6 years however they are 10″ (approximately) in length so they’ll be scrunchy on newborn baby legs, which looks cute for pictures but won’t be tight around legs.